Our own local experience here at the library demonstrates that young people continue to be active users of the library. 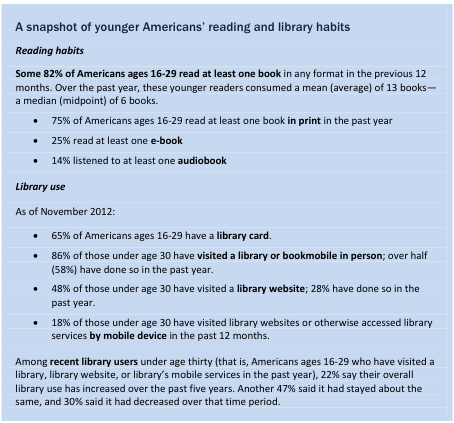 Just this week the Pew Internet & American Life Project released a report of their research, “Younger Americans’ Library Habits and Expectations“, that offers up a larger picture of trends in library usage and expectations amongst youth. Not surprisingly the picture is complex and show the continuing transition in how we create and consume information. Paralleling our local experience, national trends show continuing increases in visits, circulation of materials, and Internet usage. According to the report, 38% of those aged 16 – 29 years old used the Internet at a library in the last year compared to 22% for those 30 and older. 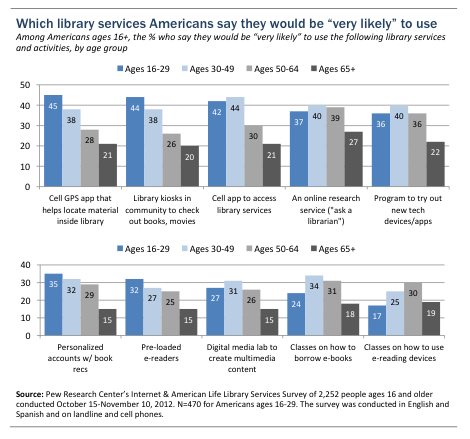 Similarly, younger Americans’ library usage reflect a blend of traditional and technological services. Americans under age 30 are just as likely as older adults to visit the library, and once there they borrow print books and browse the shelves at similar rates. 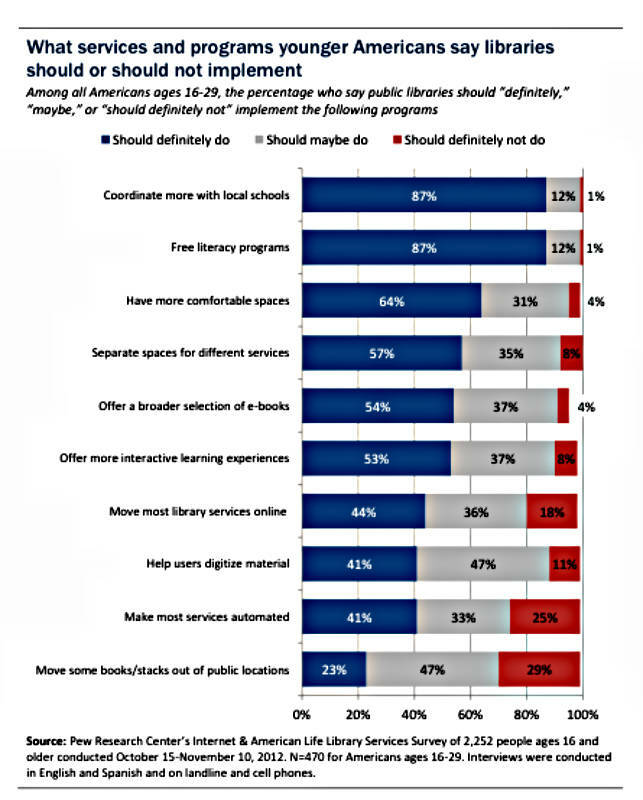 Large majorities of those under age 30 say it is “very important” for libraries to have librarians as well as books for borrowing, and relatively few think that libraries should automate most library services, move most services online, or move print books out of public areas. At the same time, younger library visitors are more likely than older patrons to access the library’s internet or computers or use the library’s research resources, such as databases. And younger patrons are also significantly more likely than those ages 30 and older to use the library as a study or “hang out” space: 60% of younger patrons say they go to the library to study, sit and read, or watch or listen to media, significantly more than the 45% of older patrons who do this. And a majority of Americans of all age groups say libraries should have more comfortable spaces for reading, working, and relaxing. This entry was posted in News, Young Adults and tagged Internet, PEW, PEW Internet & American Life Project, resources, teens, trends, young adults by markorton. Bookmark the permalink.